Bill Clinton once embarrassingly tried to defend his actions by questioning what the meaning of the word ‘is’ is. We know what is is but you might be surprised to find out what today’s Nice Price or Crack Pipe IS is. We’ll still have to see just what that means its price… well, you know, is. Alton Brown likes to use the phrase ‘a pint is a pound the world round’ indicating that no matter where you are a pint of water weighs one pound. That’s apparently not exactly true as the measure of a pint can in fact be location dependent. Also, it doesn’t work on the Moon, which is weird because that technically does go around the world and hence… oh for heaven’s sake, where was I? Oh yeah, the International Monetary Exchange. Have you ever considered existentialism? Are you a devotee of Sartre or Kierkegaard? In broad terms, Existentialism is the 20th century philosophical theory that ‘is centered upon the analysis of existence and of the way humans find themselves existing in the world.’ Existentialists seek to discover the true meaning of what it means to exist, or even what existence really is. 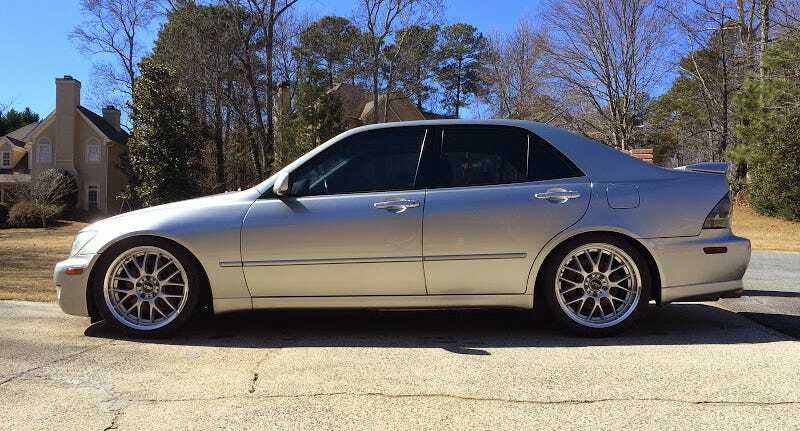 Well, it’s Monday and I’m a little too hungover tired to delve into that level of philosophical thought right now, so instead we’ll just have to consider another type of is, which is this 2001 Lexus IS300. Lexus has long positioned their IS series as a BMW 3-series competitor. Made available over the years with a series of fours, sixes, and, in the ‘we give an Eff’ series, with a romper-stomper V8 they’ve trie to go toe to toe with the German standard barer. That F’d up IS is the hottest factory edition, but it didn’t arrive until the second generation, which that honestly is a good bit heavier than the first one was. And, if you really, absolutely, positively, in need of a performance V8, well, who you gonna’ call? This IS wears a bowtie under its hood, a 6.2-litre LS3 late from a low-mile GM ride and rocking new heads one to be exact. The seller says that mighty motor (400+ ponies at the wheels, so he says) and its workmate T56 six-speed gearbox were squeezed into the car by Matt Owen of Dedicated Motorsports, who apparently knows what he’s doing. The seller also notes in his ad that the 6.2 weighs in at less than the 2JZ-GE that it replaced. Take that, Japan! It’s not just a mill upgrade either as the seller says that all of the other mechanical systems have been brought up to task as well. Hell, the car even has working A/C. The ad has a detailed list of the parts and the brands, and it looks like something you might be reading to Santa while sitting on his lap. Aesthetically, the car seems to present well too. The seller notes some imperfections in the paint, but over all it looks pretty solid. It sits on a set of BBS-aping ASAs and it has a pretty nice - oh man, I’m loathe to use this word - stance. On the inside things are equally tidy and not too ‘Yo Brah!’ for most people’s taste. Yeah it has a big stereo, and there’s a subwoofer knob wired to the driver’s seat, but let’s just gloss over that, m’kay? Is it all unicorn back rubs and endless free doughnuts though? Nope, but it seems pretty close. The seller notes that the car sometimes pops out of reverse, and that - again - the paint ain’t perfect. What is clean is the title, and the car has had three owners, including the present one, since the swap. He’s now asking $22,000, and he says he’s priced it to move. We’re here to help him figure out if that’s moveable money. What do you think, is this professionally- LS’d IS worth that kind of scratch? Or, is this that just not what IS is? eBay out of Georgia, or go here if the ad disappears. H/T to the owner, Nick Thompson, for the hookup!